So far we have learned how to gather mouse input events (using the On Mouse Event action) using a Button Instance and attaching event handlers to it. This is fine for simple tasks like launching a new web browser URL, controlling an animation or for bringing up an animated menu, but suppose we want to create input forms, test for keys and display output on the screen, how do we do this? Let's look at how we can input some text from the user, perform some simple calculations and display the result. To do this we use the Character Panel together with the Text-Options panel to place our objects on the main scene work-area. 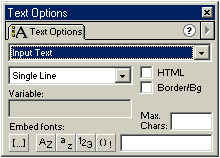 First use the 'A' tool to place some text on the screen then open up the Text-Options panel and change the type to 'Input Text'. You can enable the [x] Border/Bg option if you wish. Use the 'A' Text-tool again to place a 2nd Text instance somewhere on the work-area. This time choose 'Dynamic Text' from the Text-Options and give it the name 'txtOutput'. Create a Button if you haven't got one in your Library (or drag one from the examples if you wish). Drag an Instance of the button onto the work-area, open up the Actions-panel and attach the following action-scripting to that Button Instance. Okay, let's create a simple, global function to do something more funky with the input string. We'll be using an object.prototype so we can access it from anywhere in the current Movie (and from any other time-line too). Right-click on the very 1st frame of the root Movie on the time-line (ie. frame 1 of Scene) and add the following Actions. Secondly, we define a Method prototype from the root Object, object. This basically means we can just use 'my_function_name(..)' anywhere. Thirdly, we write our function code and pass back the result using the C-like 'return' statement. This defines a local (var) and assigns it the string value from our global _root.Counter variable. The .toString() method is used to force the variable's value into a string. This concatenates the input string (which I've forced into a String and then to UpperCase) with the temp variable. Lastly, we increment our global counter and return the resulting string to the caller. You don't need to create lots of buttons to handle more than one key press. You can assign many of these event handlers to the same Button Instance. The On Mouse Event (or 'on (....)' for short) allows a number of different event triggers (Press, Release, Release Outside, Roll Over, Roll Out, Drag Over, Drag Out and (of course) keyPress). But there isn't a way to repeat an action while the mouse button is held down, is there? This is where those Movie-Clip containers come to the rescue once again. We can create an empty Movie-Clip with 2 KeyFrames and place some action-scripting on the 1st frame. This Movie-Clip will act like an animation and will continously loop (repeating our actions). Once our 'repeater' Movie-Clip is in the Library, all we need to do is to drag an Instance of it inside our Button's 'Over' frame. So whenever the mouse is moved over the button, that invisible 'repeater' animation will kick off and run.... of course the same actions will happen for every Instance of the same button, if you don't want this to happen then use the Duplicate Symbol option in the Library window to create another copy of the Button Symbol. As you have just seen we can easily create individual task-like repeating actions by placing them inside different Movie-Clip containers (remember each has its own time-line). You can extend this simple idea to create concurrent actions (for example, a rough timer/interrupt for dealing with time-outs). Another way to perform time based actions is to use the getTimer() function to see how many milliseconds have passed since starting the Movie. Another point worth noting is that your Button image frames don't have to be static, you can use a Movie-Clip animation in each of the 3 KeyFrames (Up, Over and Down) to create some funky animated effects. One word of warning, Flash doesn't seem to be able to loop on a single frame. It treats it as a one-shot event (any action on the Time-line will only happen once, when the frame is encountered), this is why you need to use a minimum of 2 frames to perform loops. You should be familiar with the basic input and output functions of Flash. When creating interactive stuff you will be using the above techniques alot.